Polyhymnia is the muse of choral poetry and I choose her this week to mark the collective efforts of the Seaford Striders. I had a good half-term week, with four runs and some swimming. I ran with the Striders on Wednesday, in clear and very cold conditions, when the stars shone as bright as I've ever seen them, and on Saturday afternoon I ran up on Seaford Head, with a sunset out to sea coloured with the most extraordinary oranges and pinks. Sunday was less attractive, with constant heavy rain, and my plans for a long run out to Frile Beacon ended up as a much shorter outing along the sea-front to the sailing club and back. Meanwhile tougher runners than me took on the Brighton Half Marathon. The first Strider home was Matthew Eade in 1:21:37, while the first woman Strider was Diane Fletcher in 1:42:33. Seventeen of us finished. Help us, Polyhymnia, to sing their praises with well-tuned voices, chanting in precise metre. Euterpe, the muse of music, provided the inspiration for Sunday's run. This was my last Sunday morning in Eastbourne, as my daughter's dance rehearsals ended with participation in the Eastbourne Music and Arts Festival in the afternoon. Snow, deep in places, lay on the higher ground and I had only an hour to spare for running, so I set off towards Jevington, taking the route of the Beachy Head Marathon. The gradients and the snowy surfaces slowed me down and it was one of my slowest runs ever, but a run is a run. As for music, I have never listened to music while running. If I ran indoors on a treadmill, I might, to alleviate the monotony. I have not run on a treadmill for many years, not since I worked in Westminster and used a gym. There I watched the television news as I ran; I went there one September lunchtime in 2001 and saw the first reports of 9/11 come in. Since I am able to run over the Sussex downs and cliff-tops, I feel I would be missing something if I stuck earphones in my ear. I am an keen though ignorant lover of bird-life, and the sound of a lark heard up on Beddingham Hill is one of the finest things I have ever experienced. One day I will hear the distinctive cry of a Great Auk, or the thud as the ground shakes underneath a Giant Moa's footfall. I do however sing as I run, to myself or out loud if alone, to keep my spirits up and my rhythm going. A favourite, for no clear reason, is The Pogues' Streams of Whisky. In the Chichester 10K on 7 February the first man was Toby Lambert of Winchester & District AC in 29:32 and the first woman Amber Moran in 34:48. 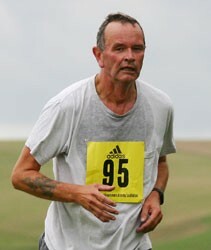 The first Seaford Strider home was Gary Hatcher in 37:24. Urania was the muse of astronomy, and I honour her today as I watched the sky assiduously during yesterday's long run. The day began with sun, but by the time I arrived in Eastbourne and dropped my daughter for her dance rehearsal, it had clouded over. I set off from my usual place, a few yards downhill from the start of the Beachy Head Marathon, and set off once more up that steep incline, then over Beachy Head and down to the base of Belle Tout, and then, all of a sudden, the sun came out. I followed two other runners up the track to the lighthouse, then down to Birling Gap. At the bottom I returned by the route the marathon takes, a slight detour inland, so the feet of hundreds of runners don't erode the cliffs too much. Back over Beachy Head and, once more, a quick run along the promenade to the lifeboat museum and back. At 9.75 miles, this is the longest distance I've run since last year's Lewes Downland Ten at the end of October. I shall keep increasing the distance over the six weeks till the Hastings Half Marathon. Last week I honoured Terpsichore, muse of dance, in the title of my account of my Sunday run. for the dance was the cause of my visit to Eastbourne.This week it is the turn of Clio, muse of history. Once more in Eastbourne, I decided to run over Beachy Head, repeating the final stages of the Beachy Head Marathon. Beachy Head was my first marathon and I have run it five times, hence my homage to Clio. Parking the car near the start at St Bede's school, I ascended the brutal hill on a fine but cold morning. The summit is not far at all, around a mile. Then I began the descent on the western side, going as far as the foot of Belle Tout, where I turned and started the long climb back. This is one of those dispiriting climbs, for twice the path dips, sending the runner down. Nevertheless I soldiered on; I was still fresh, unlike during the marathon, when these last hills come after twenty-three miles of running, and the murderous ups and downs of the Seven Sisters. In fact I was so fresh I added a couple of miles along Eastbourne front, as far as the lifeboat museum. Eastbourne is everything that Seaford is not. It has all those appurtenances of a seaside town that we seem to have missed out on, a pier, a bandstand, statues of dead monarchs erected by public subscription, seedy hotels where at breakfast-time sullen waitresses point guests at lukewarm eggs, sausage and bacon festering above a bain-marie. If running along the front, one has to dodge not only pensioners and dogs, but dirty-weekender couples who either, if still besotted, fondle each other lasciviously in the middle of the path or, if the weekend has gone badly, sulk and refuse to stand aside. That's eight miles in the bag and, with a dental appointment to keep me in Seaford one weekday, I also had an unusual weekday morning run. Seven weeks till the Hastings Half marathon. At Saturday evening's Seaford Striders awards evening, Eric Hardwick, the Hastings race director, presented the prizes.